Evgeny Kochetov was born in 1980 in Voronezh. In 1986-1994 he a was student in Music School Noll in Voronezh under Tatiana Klepikova. 1994-1998 - a student of Special Music School at the Voronezh State Academy of arts under Professor Jury Brusentsev. In 2003 he graduated from the Voronezh State Academy of arts under J. Brusentsev. Evgeny finished the postgraduate study at the Russian Gnessins Academy of music under Professor, the People's Artist of Russia Vyacheslav Semionov in 2003-2006. The musician has concert tours along Russia and abroad, performs with various orchestras. Evgeny Kochetov - a winner of international competitions: Cherepovets (Russia, 1997), Pula (Croatia, 2000), Surgut (Russia, 2004), "The Cup of the World" (French, 2004), Klingenthal (Germany, 2005), Moscow (2005), Kiev (Ukraine, 2006), Peking (China, 2007). 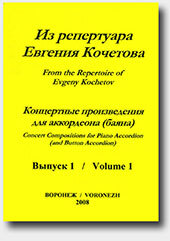 In 2008 "The Aleinikovs' Publishing House" published a music collection of pieces titled "From the Repertoire of Evgeny Kochetov" (Voronezh, Russia, 2008). This collection includes transcriptions of compositions by S. Rakhmaninoff, A. Piazzolla and N. Dautov arranged for bayan and accordion by E. Kochetov and V. Semionov. In addition, the collection includes "Capriccio №2" by V. Semionov with E.Kochetov's improvisation and compositions for accordion by E. Hog and F. Marocco in style of Variete and jazz.